Asian Sesame Steak Fajita Salad combines all your favorite flavors of fajitas along with a sesame lime cilantro dressing into one jam-packed and flavorful salad! Best of all, you can make this on the stove or your grill which is perfect for those warm summer evenings. Summer is here in full swing and we’ve been finding every excuse to toss all the things onto the grill while trying to stay cool with lots of fruit, frozen treats and loaded salads. I love salads and have one everyday for lunch and sometimes dinner, but sadly, my husband, who is a big meatavore, does not share my salad obsession. He did however go wild for my Chicken Teriyaki Caesar Salad and this Asian Sesame Steak Fajita Salad which has been making it’s way onto our dinner rotation regularly for the last two months. It comes together in just 30 minutes and is loaded with a TON of flavor. You can cook the meat using your skillet, or toss it onto your grill. My husband cooked the steak to be kid-friendly but you can totally cook the steak to your liking. Throw in some sweet corn, crunchy red and yellow bell peppers, creamy avocado, crunchy romaine and anything else you can scrounge around in your pantry. Then give a good dousing of the sweet and savory sesame lime vinaigrette that also doubles as the marinade. It’s SO good that I have been seriously putting it on everything under the sun. A lighter and tasty meal that’s jam-packed with goodies. Plus – ready in under 30 minutes! Not bad for a Thursday. Another 30 Minute Thursday to be exact so be sure to visit all the other yummy recipes below! 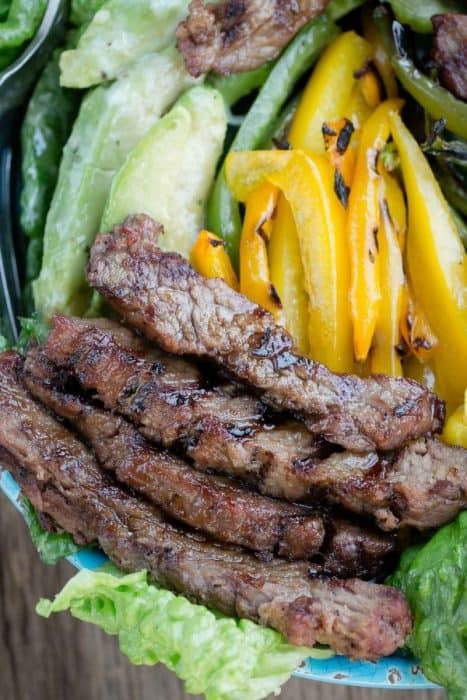 Asian Sesame Lime Steak Fajita Salad combines all your favorite flavors of fajitas along with a sesame lime dressing into one jam-packed and flavorful salad! Make the marinade/dressing: Whisk all the marinade ingredients together. Reserve half of the marinade in the fridge to use as the dressing and pour the remaining half into a large zip-top bag. Add steak to bag and marinate for at least 15 minutes. Meanwhile, prepare the other ingredients and start cooking the bell peppers. Drain the steak and discard the marinade. For the grill: Preheat grill or broiler and allow to get very hot. 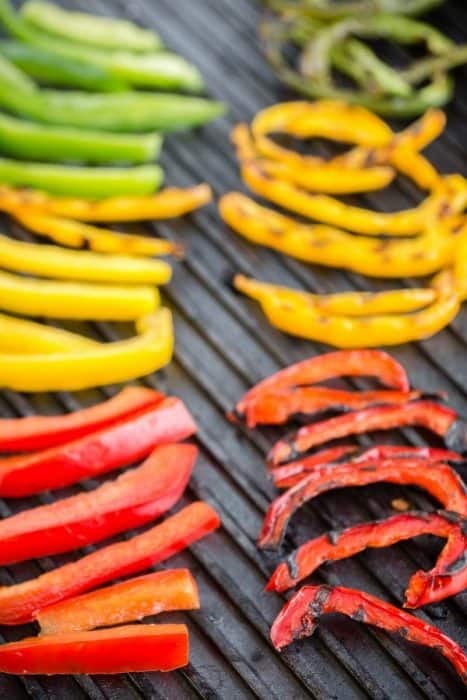 Lightly oil the grill grate, and place bell peppers on top. Cook for 2-3 minutes per side, or until grill marks appear. Remove and cut into slices. Remove the steak from the marinade and gently shake off any excess. Grill for about *5-6 minutes per side, or to desired doneness. Transfer steak to work surface. Let stand 5 minutes. Cut across grain into thin strips. Heat 1 tablespoon olive oil in a large cast iron frying pan or skillet on high heat. Place the steak (work in batches) in hot pan and allow to sear for 2 to 3 minutes on each side. Lower the heat then allow steak to cook for *6-7 minutes, or until desired doneness. Transfer steak to work surface. Let stand 5 minutes. Cut across grain into thin strips. Quickly wipe down the pan and return to medium high heat. Add remaining 1 tablespoon olive oil in the skillet. Sauté the peppers, stirring often, for about 6-7 minutes, or until softened and slightly caramelized. To assemble the salad: While the steak and peppers are cooking and resting, add lettuce to a large bowl and gather and slice the avocado. Add to the bowl along with corn then the bell peppers and steak once ready. Drizzle with reserved dressing and sprinkle additional chopped cilantro and give another squeeze of lime, if desired. *you can also useThai sweet chili sauce & reduce honey to 1 teaspoon or use more) or add an additional 1 tablespoon of soy sauce instead if you can't find fish sauce or would rather not use it. It won't have that same umami flavor but will still taste great. **We cooked the steaks to be kid-friendly so feel free to cook the steak to your desired liking. **To make ahead, you can prep the bell peppers in advance by cutting them into strips the night before and whisking the sauce together and storing it in a resealable glass containing while using the other half to marinate the steak overnight.